I was very disappointed by the room they gave me. I booked a single room, but the only window was opening on an internal and closed corridor. Basically there was not air at all and keeping the window open every passing-by person could have looked at me sleeping or even steel something from the window. The breakfast was terrible! Undrinkable artificial orange juice and terrible coffee. 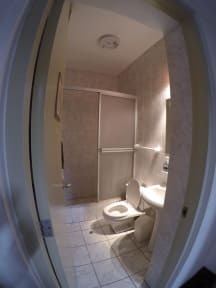 Toilet... well you needed to have a flexible personality!